This field of view is from a tapelift collected in a home. Sporangium are rarely present at elevated levels in a home unless the sample is collected in the immediate vacinity of a fern growing indoors. If sporulating ferns are in the vacinity of the building then it is not unusual to see some sporangium in the indoor sample. The sporangium is the capsule in which the fern spores mature and the mechanism that then disperses them into the air. 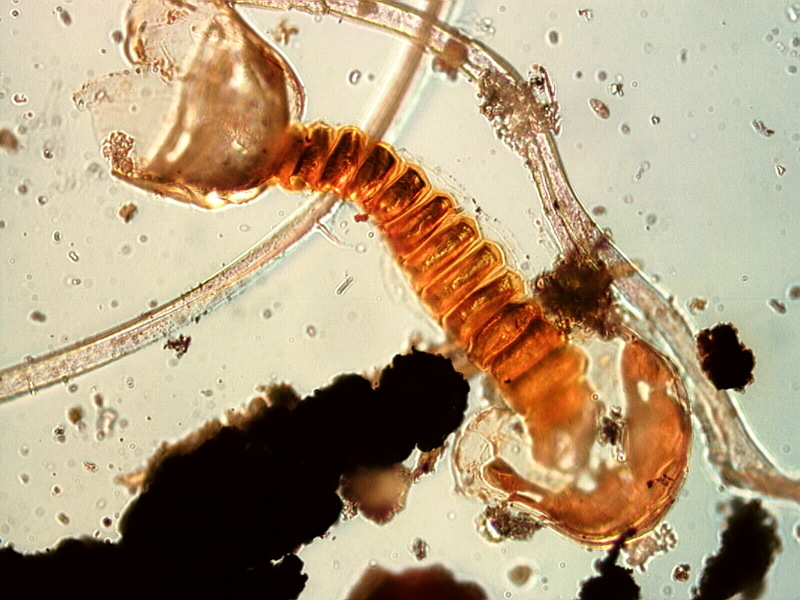 The two ends of the sporangium form the "bag" in which the spores mature. The sporangium is attached to the underside of the fern leaflet initially. When the spores are mature the sporangium releases the spores forcefully by snaping open. The sporangium is part of the natural backgound at certain times of the year or may be part of the building background when ferns are grown indoors. The sporangium is not associated with health complaints but may indicate a source of fungal spores that may be in the sample. Ferns require a fair amount of moisture to grow. When grown indoors the soil in which they are planted can become a significant source of fungal spores. If these fungal spores are present in the sample it may be advisable to inspect the fern's potting soil. Fungal spores are a potential allergen. The narrow redish/brown segmented body with well defined birefringence when viewed with cross polarized light is characteristic of fern sporangium. The birefringence is much higher than insect carapace and a bit lower than most cellulosic plant parts. The broad head and tail termination on the complete sporangium are also characteristic. Sporangium are found with fern spores though fern spores may be present without sporangium in the sample. Fern spores are more mobile than sporangium. Pollens, fungal spores, moss spores, and other debris from the outdoor environment are typically associated with sporangium from outside the indoor environment. If the source is indoors then fern spores will be as common than pollen in the sample or even more so.